Last week, the students of Marjory Stoneman Douglas in Parkland, Florida experienced a horrible act of violence as a gunman entered the school and killed 17 people. You can read Chair Tina Podlodowski’s response here. This week, the students showed the country that they would not be intimidated or bullied into silence by the gun lobby. One week after the shooting, they were on national TV confronting a spokesperson from the NRA in a CNN town hall event. They also spoke directly with their elected officials during the town hall, including U.S. Senator Marco Rubio, who has received $3,303,355 from the NRA. The NRA has made an imprint on politics here in Washington State, as well. In 2010, the NRA spent $414,100 backing Dino Rossi’s bid for U.S. Senate against Senator Patty Murray. Rossi, the 2018 GOP candidate in the 8th Congressional District, has refused to discuss gun policy in the wake of the Parkland shooting. He has refused to comment to the press, and he refuses to answer voters’ questions about his stance on common-sense gun reform. We mentioned last week that Dino had been hiding voters’ comments on his Facebook page. Since then, the problem has become much worse. He’s been hiding or deleting every comment left on his Facebook page that asks him about his position on guns, inquires about his relationship with the NRA, or expresses disappointment in his habit of hiding comments and silencing voters. We called him out on it. And when he kept at it, we called him out on it again. Someone even printed out one of our posts and taped it to the door of Rossi's unmarked Issaquah office. But Dino doesn’t seem to be learning that silencing the voices of scared parents, curious voters, and could-be constituents is a poor practice that betrays an almost Trump-like thin skin. Another Republican who has shown equally appalling judgment is Cathy McMorris Rodgers. As you may know, March 24th is the date of March For Our Lives, a nationwide demonstration to honor the victims of gun violence and advocate for common-sense reforms. 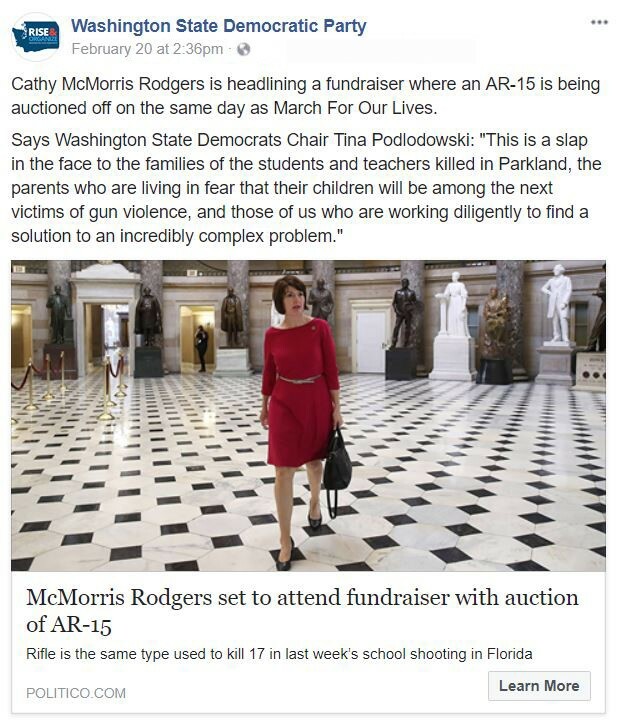 Cathy McMorris Rodgers, however, is scheduled to headline an event put on by the Stevens County Republican Party on March 24th, an event where--until a couple days ago--an AR-15 was going to be auctioned off. An AR-15 was the weapon used to kill 17 people in Parkland. An AR-15-style rifle was also used in November’s Sutherland Springs church shooting in Texas to kill 26 people. And in October’s mass shooting in Las Vegas, the deadliest in U.S. history. And Cathy McMorris Rodgers, according to the Stevens County Republican Party, has headlined at least two events where these weapons have been auctioned off in the past couple years. And she was about to attend another this year, until she was caught. The press got word that she was scheduled to headline an AR-15 auction event and called Cathy, asking her to explain herself. 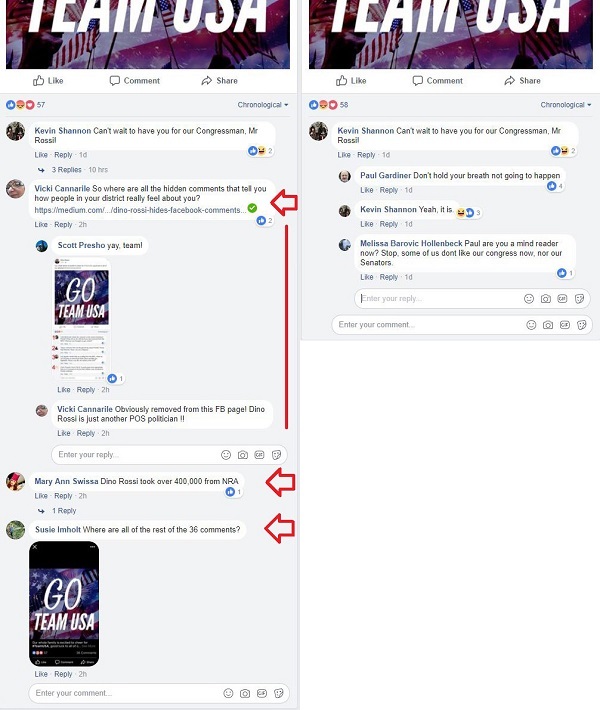 That day, the event on the Stevens County Republican Party’s website was changed to remove mentions of the AR-15 and the 10-22 Ruger rifle that was set to be the event’s grand door prize. The Stevens County Republicans then said that they will be auctioning off a gift certificate to a local business instead of the AR-15. If you need to be told that you shouldn’t glorify a deadly weapon on the day that survivors of a shooting are honoring their friends and family who were murdered with that weapon -- you don’t have the judgment to effectively represent your constituents in Congress. This week saw some big news for Democrat Lisa Brown, who is challenging Cathy McMorris Rodgers in the 5th Congressional District. The Democratic Congressional Campaign Committee has moved her race into the highly competitive “Red to Blue” program, meaning the race to unseat McMorris Rodgers is now one of the most contested in the country. This comes after the exciting news last week when a DCCC poll found McMorris Rodgers’ lead had shrunk to within the poll’s margin of error. This was a rough week for Dino Rossi. He faced (and then ran from) tough questions from potential constituents. He was exposed for hiding their comments. And on Thursday, a Public Policy Polling poll was released showing that if the election were held today, Dino would lose to a generic Democrat in a 44-43 point race. 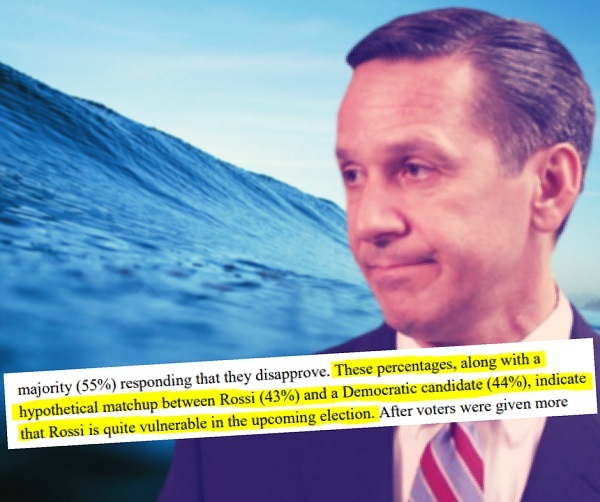 The great polling news coming out of the 5th and 8th Congressional Districts is energizing us! It means our organizing strategy is working, but we can’t get comfortable or complacent. So we’re continuing to ramp up our on-the-ground efforts across the state. 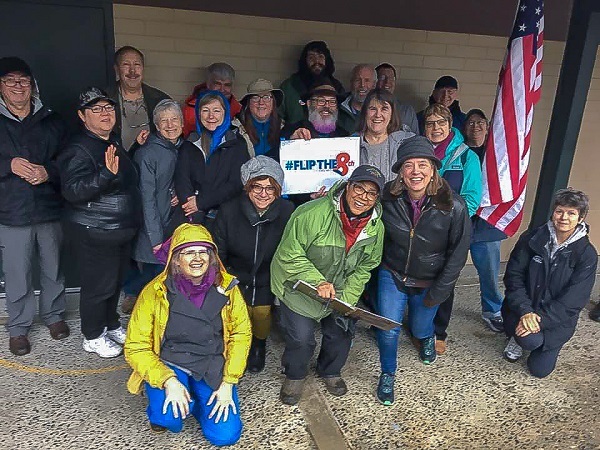 This weekend, we will be canvassing in Spokane, Maple Valley, Sammamish, Enumclaw, Snoqualmie, Algona, Walla Walla, Black Diamond, Vancouver, Ephrata, Port Orchard, Poulsbo, Pasco, and Yakima. We’ll also be holding a Tri-Cities Organizing Academy today. We HAVE to keep building to hold onto the momentum in close races. You can help by finding an event near you and joining us! Or make a contribution to help us elect Democrats up and down the ballot. Organized labor is responsible for advancing our society and transforming our country into a more just and equitable place. Through collective bargaining, labor unions have amplified the voices of workers and given them sufficient leverage to stand toe-to-toe with some of the world’s most powerful corporations. The result has been the consistent strengthening of workers’ rights and an ever improving quality of life. But the ability of unions to continue this work may soon be threatened. On Monday, the U.S. Supreme Court will be hearing arguments in Janus v. AFSCME, a case that disputes the duty of public employees who are not union members to pay union dues, even though they enjoy many of the same protections and benefits as those public employees who are union members. This issue last came before the U.S. Supreme Court in 2016. However, after Justice Antonin Scalia’s death, the Court’s decision was split 4-4. With the conservative Justice Neil Gorsuch filling the vacancy, there is a real danger that the Court will lash out against unions. Last Chance for Hamilton Tickets! 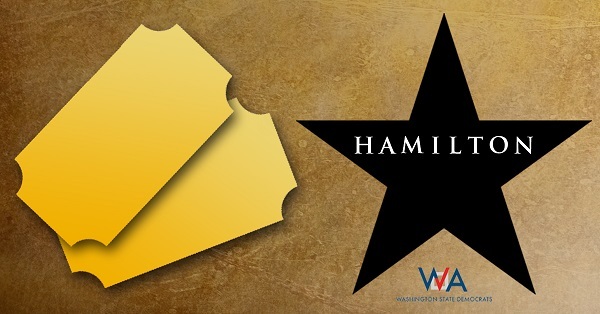 We are less than a week away from the drawing in which we’ll select two winners to see Hamilton with a guest at the Paramount Theatre in Seattle on March 9th! The contest closes at 11:59 pm Thursday night, so make sure you’ve entered for your chance to win by then! Chip in $5 (or whatever you can) to be automatically entered! 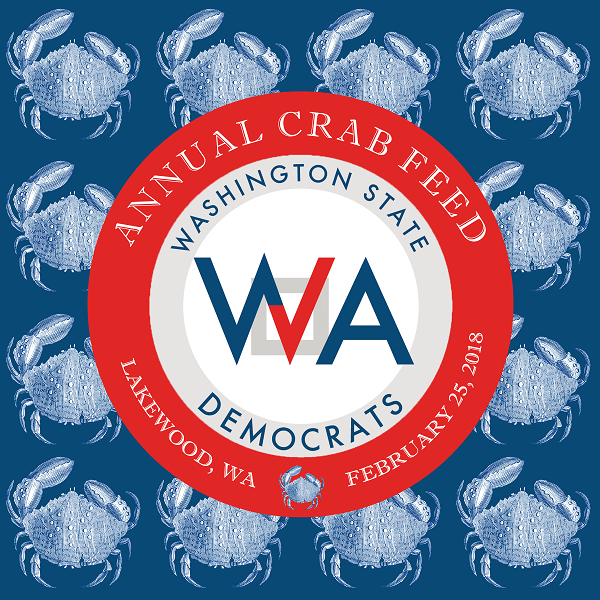 Tomorrow we’ll be holding our 2018 Crab Feed in Lakewood! Tickets are still available for purchase! Join us for a locally sourced seafood buffet and discussion with Democratic elected officials. We’ll also have a vegetarian option. Purchase your ticket now, and we’ll see you in Lakewood! If you’re not already a member of our monthly low-dollar donor program, you can join here. A few dollars a month will help us continue to hold Organizing Academies, train volunteers, and mobilize to defeat Republicans like Cathy McMorris Rodgers and Dino Rossi. 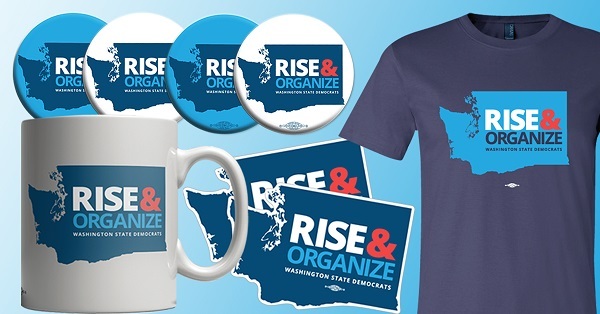 Plus you'll get some new Rise & Organize gear when you sign up!